As we enter the 21st century it is clear that the economic growth China has enjoyed has been extraordinary. Although Western countries continue to dominate the world economy and financial markets, the capital markets pf Hong Kong, Singapore, Shanghai, and Shenzen have matured considerably and are eager to become major global players As business owners in the rest of East Asia are predominantly of Chinese descent, or under Chinese cultural influence, the economic vitality of the rest of the region has been credited to the adaptability, flexibility and ingenuity of Chinese entrepreneurship nurtured by a particular (Confician) heritage.In Chinese Entrepreneurship in a Global Era Raymond Wong and contributors analyse the tremendous changes in the global, regional and local environments in which Chinese entrepreneurs operate and explores whether a new breed of Chinese entrepreneurs has developed in response to these changes. 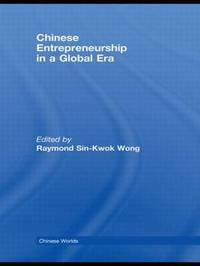 Including theoretical discussion and empirical case studies on Chinese entrepreneuship in Hong Kong, China, Singapore, Thailand and Vietnam, the book will be an invaluable resource to students and scholars of Chinese and East Asian business and entrepreneurship. Raymond Sin-Kwok Wong is Professor of Sociology at the University of California Santa Barbara, USA.